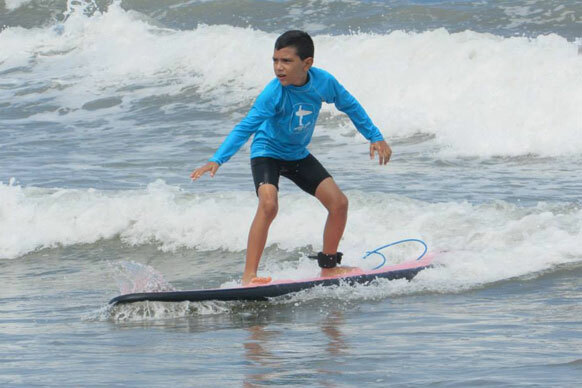 Your trip to Costa Rica wouldn’t be complete without the thrill of catching your first wave! 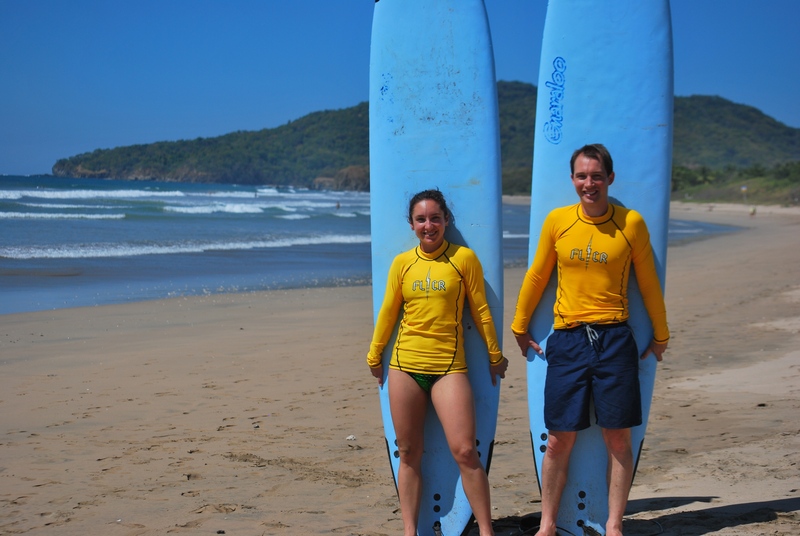 Having a surf lesson in Costa Rica is like jelly to peanut butter! 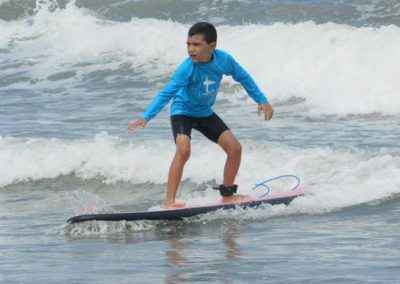 From beginner surf lessons to surf lessons/ coaching for accomplished surfers, Frijoles Locos Surf Shop in Playa Grande offers a complete range of surf lesson options. 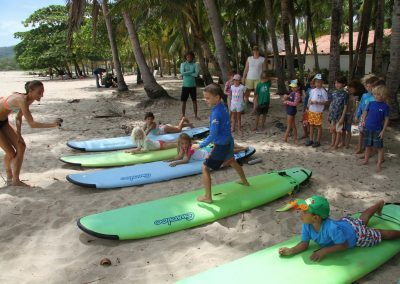 People of all ages, from kids to grandparents, enjoy our professional, fun, and safe surf instruction. 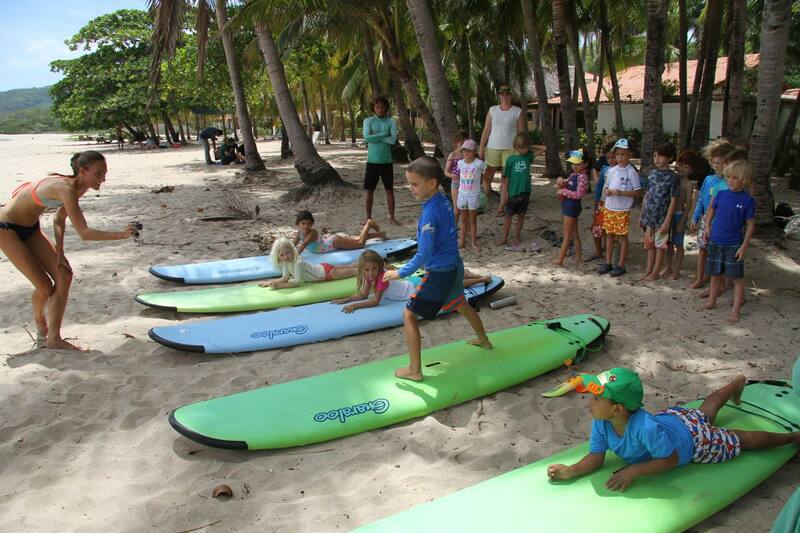 Small group surf lessons (max 4 students per instructor) or private surf lessons are available. We employ responsible, mature, patient and enthusiastic surfers who love the sport and love to teach. We aim to make your first and following surfing experiences fun while safe, and will take you to the places with the best conditions to learn on. Safe, fun lessons for all levels. Beginners will learn with other beginners, in small group lessons of a maximum of 4 students per instructor. Surf coaching is available for intermediate and advanced surfers. 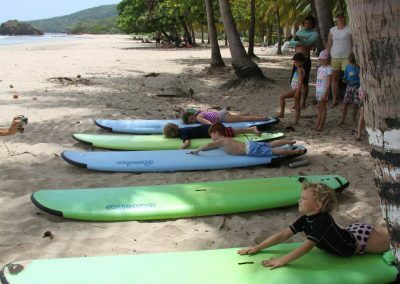 We suggest private surf classes for advanced beginners and up, or those who prefer a more personalized service, and to ensure individualized instruction. From tiny-tot kids to grand-parents, anyone can learn and have fun too! If you would like to request one instructor per 3 or 4 of you, cost will be $120 for the lesson. This is preferred by those who wish to surf with just their friends/ loved ones/ family. If you are organizing larger groups, please contact us for specifics, assistance and options for planning your large group (12 + participants). Pick up and drop off at your hotel or rental house in Playa Grande is included in private lessons. Transportation from other towns can be arranged for an additional fee. See below for areas serviced by our transportation network. Reserve online to make your reservation asap! Our years of experience as an established surf school business combined with how we only schedule lessons at the best possible time dictated by the tides, means space is limited! 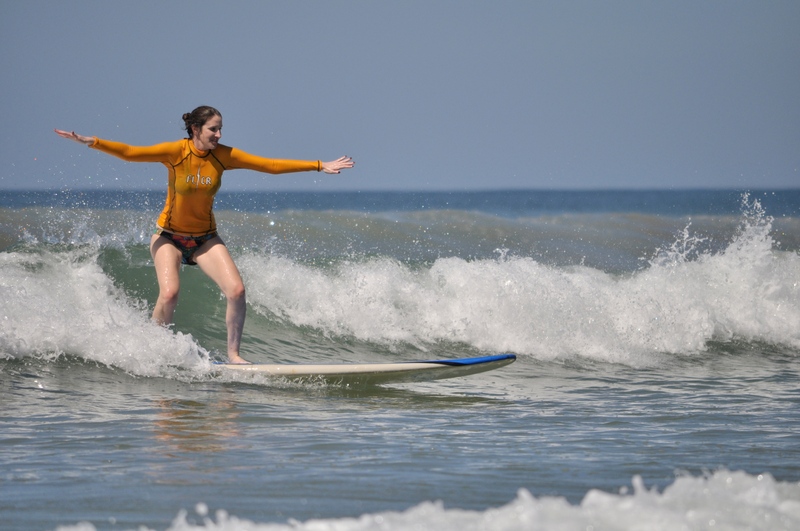 Why Playa Grande for Surf Lessons? Uncrowded beach. Room to move. Focus on learning, not obstacles! 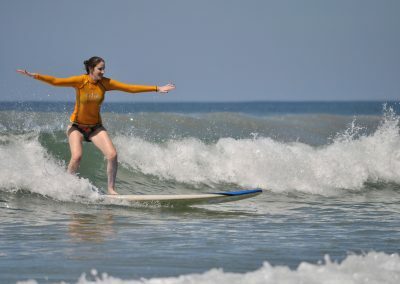 Obviously, you have the entire country of Costa Rica to choose from as your surf lesson destination, so why Playa Grande? There are a few reasons. Lack of crowds is one big reason. When learning to surf, the last thing you want is to be among 50 other beginners taking their first surf lesson. Playa Grande literally translates to “big beach,” with plenty of space for our surf instructors to select a quiet, uncrowded location for your surf lesson. Playa Grande is a long stretch of beach, which, at the most southerly point intersects with Tamarindo. 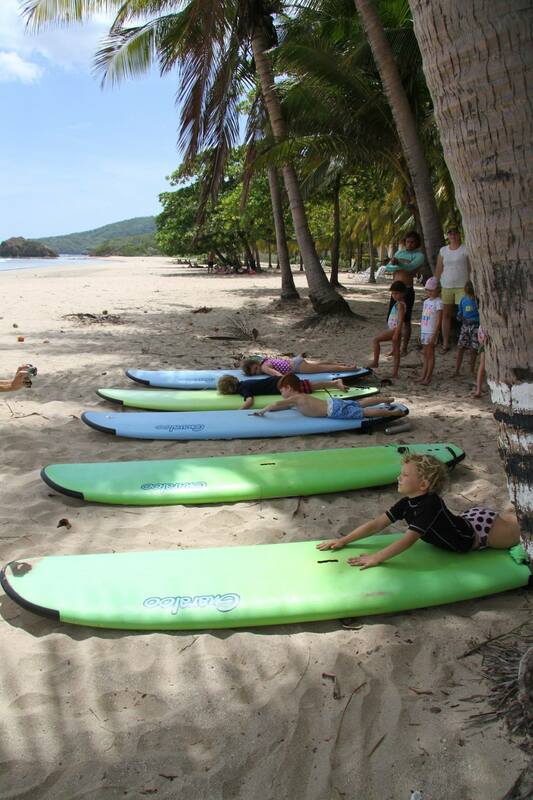 Typically, the south end of Playa Grande beach has the smallest waves most suitable for beginner surf lessons. There may be some days where it just is not the right conditions for lessons, and we will advise you of this, suggesting another, more suitable day. For us, it is much more important that you enjoy your surfing experiences here in Playa Grande, and that you are taken surfing when the conditions facilitate this. Guided surf trips are available to Playa Grande, Avellanas, Marbella, Little Hawaii, and other secret spots! It will depend on what the waves are doing (swell and wind etc) as to where you are taken. The furthest point away is Marbella, and takes a little over an hour to get there. With this time frame, you are looking at almost 3 hours of water time. Includes: Door to door transportation, surf guide to help you maximize YOUR wave count (not his), cooler with ice, water, juice, fresh pineapple, and a beer each. Spare wax, spare leashes, spare fins in case you break your own. Based on availability, book ahead! Hire one of our surf staff (who have completed their open ocean rescue course) to watch over you and your family, and/ or teach you ocean awareness so that you can enjoy the ocean without the risks. 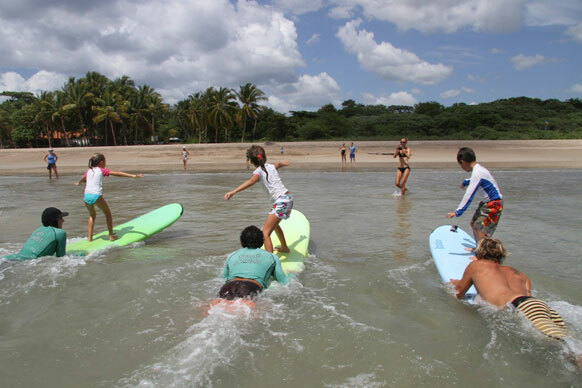 If you are staying at the Westin Reserva Conchal, Four Seasons Papagayo, Playas del Coco, Playa Ocotal, Playa Danta, RIU Guanacaste, Playa Brasilito, Playa Flamingo or any other northern beaches, Playa Grande is one of the closest beaches to learn to surf. 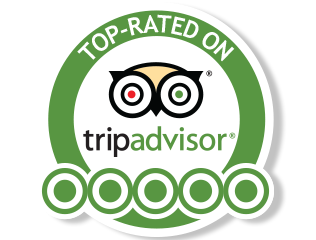 Ask us for directions on how to get here if you have your own rental car, or if you need transportation organized for you, let us know. Best Surf Lessons I have ever had! 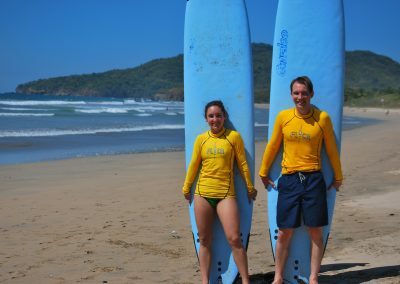 I am a beginner-intermediate surfer who has only surfed 4 times (all with lessons) before coming to Costa Rica. I took a 2 hour lesson, two days in a row. The head instructor JJ is fantastic. We spent the time working on fundamentals, technique, and remaining calm in the water. I felt myself improve in all 3 areas. On the second day I was able to surf a 5′ wave for over 100 yards, first time ever! All credit goes to JJ, he really helped me improve in a short period of time. They are extremely safety conscious and very attentive to their clients. Highly recommend!! I will definitely be back for more next time I’m in Costa Rica!